A creamy sauce coating a stir fry of complementary flavors will make this delightful dish a favorite at your home. If you find yourself too exhausted to make your family dinner every night, there is a better solution than bringing home fast food or serving spaghetti constantly. This organizational tip will save you time and money, as you will end up cooking and shopping only once a week. 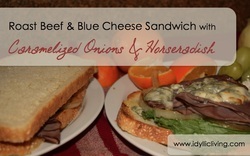 One of my favorite recipes is this delicious sandwich topped with blue cheese sprinkles and other flavorful ingredients, and the best part is it only takes a few minutes to prepare! 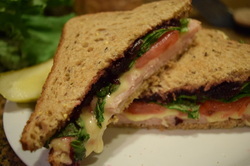 This easy to make recipe is a favorite for leftover Thanksgiving dinner turkey and cranberries, but it can also be made throughout the year with luncheon meat. After a recent trip to a pick-your-own farm where I gathered a considerable amount of basil, I went online to find the easiest way to dry herbs. I found more than nine techniques. After reading over the different procedures, I narrowed down my list to three processes: hanging, air drying, and oven drying. By far the easiest and quickest technique to dry the basil was in the oven. Every autumn I go to a pick-your-own farm and harvest several bags of onions. This is how I keep them fresh for use throughout the following months. If done correctly, stored onions using this method should last ten months. Idyllic Living highlights how to live a peaceful, happy, and enjoyable life.